I have returned to collecting vintage G1 Transformers after many forays into modern Transformers lines. This return coincided with a request from IDW Transformers More Than Meets The Eye writer James Roberts to photograph the Scavengers toys (G1 Misfire, Krok, Crankcase and Spinister) for one panel of issue #45. Having to acquire these toys forced me to see just how much I loved buying and owning G1 toys. A solid 1987 Headmasters and Targetmasters collection has sprouted from that realisation, all packaged with good stickers maintained well by the original childhood owner. Whatever the childhood owner whose toys I bought didn't have, I found elsewhere, but I insisted on maintaining the display and item quality that already existed in the collection I had purchased. 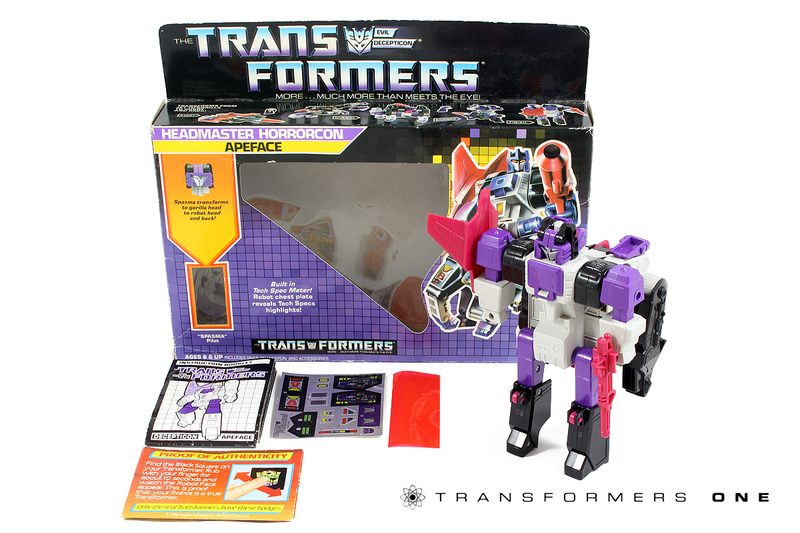 G1 Headmaster Horrorcon Apeface has been the hardest regular-size Headmaster to find in excellent condition and packaged. The one below is the second boxed one I bought, but of course the stickers were unapplied. What to do?